A few weeks ago, a friend and I were driving on the highway when a white, medium-sized dog wandered into the middle of the road. Traffic stopped as cars tried not to hit her. My friend and I parked so I could see her closely, but she started to run and I noticed she was spotting. Those little drops of blood were a clear sign that she might be in heat, so I followed her for a couple blocks and started asking around, to see if somebody knew anything about her. I was directed to a property where there are rooms for rent and around 10 families living there, where I met a man who knew the dog. He told me her name was “Cirquera” (meaning circus girl in Spanish), and that she’d had two litters of puppies. Of her first litter – 12 puppies in total – half died, and all but one had been taken away by people who were passing by. The remaining pup stayed with mom, and local people named her “Canela”. Of her second litter – also 12 puppies – only three survived. Upon examination, I realized that Cirquera was not in heat as I’d thought. My guess was that the bleeding we’d noticed was being caused by a venereal transmissible tumor, or TVT. We provided food for Cirquera and her pups, and found out the name of the woman who provided most of her care. We returned a few days later to bring the little family in to Coco’s clinic for deworming and sterilization. They were very hard to catch; hiding underneath a pile of wood, and very fearful of strangers, but with some food we managed to catch them. Unfortunately we couldn’t catch the brown one they called Canela – the older pup, from Cirquera’s first litter. But we brought mama dog and the three puppies in for some high-quality veterinary care. All four dogs were vaccinated, dewormed, and sterilized. We treated Mama for TVT and because she was headed back to the place where we found her, we fitted her with a collar and tag. When we brought mama dog back to her home Canela was so happy to see her! They were overjoyed to be reunited, and greeted each other with exuberant tail wags, sniffs, and playful jumps and leaps in the air. The puppies couldn’t go back to the street, but we hoped they would be suitable for adoption. As it turned out, we got them at just the right moment for socialization, so we made sure to give them lots of playtime and affection. In no time at all it seems, the puppies have blossomed into sweet and lovable dogs, and we are currently looking for great homes where they can begin their new lives. We named them Odessa, Olivia and Oliver. One of the pups – Odessa – was born without a tail, although her two siblings each have a long wagging happy tail. So far, only she has found a home, but we are confident that the other two will find their forever homes very soon and be able to wag their long tails with joy for their new owners. 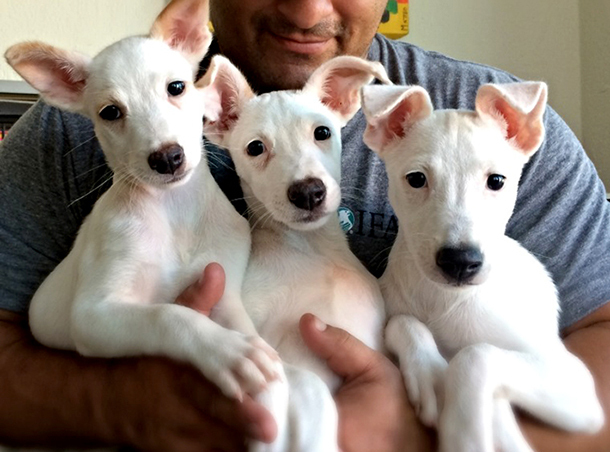 Learn more about IFAW efforts to help companion animals around the world on our campaign page.